My 2014 "Must Have" Calendars! If you are not already following The Art Of The Doll - Photography By Sharon Wright on Facebook, it is totally worth the occasional headaches of being Facebook's advertising audience and marketing reaseach pool to do so. 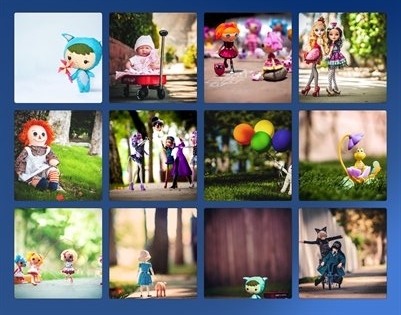 :D She creates magic with her photos, bringing dolls to life in a way other photographers don't match. She has a unique eye, and you will swear the dolls in her photos are strolling down the street shopping, skipping rope, or performing ballet. And this year she is making some of her fantastic prints available in a calender for 2014. One she is devoting entirely to the Integrity doll line, including photos of one of my favorites, Poppy Parker. Preview image of back cover for Integrity doll-devoted 2014 calendar. However, the one I must have is her "Toys" version. It features the first picture of hers I saw, showing Monster High dolls playing "keep away" with one of their heads. That photo started me following her, and is still one of my favorites. But you need to check out January and November. A little blue fox Binky Boo she purchased from me a few months ago is featured on those months. I still find myself grinning when I see the little guy "in action"! Preview image of back cover for Toys 2014 Calendar. Thank you so much to Sharon Marie Wright for featuring my work in your Toys calendar! I'm thrilled beyond words, honored, and very grateful for all your support. I can't wait to see what you come up with in 2014 and beyond! Newer PostFashionable Figures Etsy Shop Relaunch-20% Off Until Dec 31, 2013! Older PostMore Holiday Sewing Done!